It’s been a long winter; it seems we have been bundled up in big coats forever! As the nights start to draw out, many of us are looking forward to enjoying some spring gardening and getting out and about for some long awaited country walks. Dogs and cats are pretty good at avoiding hazards most of the time. However puppies and kittens are especially inquisitive and sometimes this can get them into trouble! 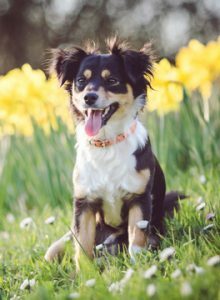 So we’ve put together some handy tips on keeping your pets safe during spring. We all love to see daffodils poking through the grass at this time of year. However many spring flowers are actually toxic to dogs. Especially the bulbs of daffodils, bluebells and hyacinths can cause severe but non-fatal illness if eaten in any quantity. The reality is that most dogs once grown up, will not bother, but do beware if you have a particularly curious pup who loves to dig! Rhododendrons look beautiful but are also poisonous to dogs. In fact many garden species if eaten, could give your puppy or kitten an upset tummy but rarely is plant ingestion fatal. One exception to this is lily species in cats. Most of the lilies in the garden do not flower until the summer but the day lily (Hemerocallis) blooms in late spring, so be aware if you have these in your garden. If any part of this plant is eaten it can cause fatal kidney failure and you should contact us immediately. Most weed killers are safe for pets once they have dried. Do be aware though of any directions on the product you are using regarding safety. If you are treating your lawns or having a commercial company do it for you, always keep your pets inside for the allotted time. If you have cats that roam free, ask your neighbours to let you know if they are likely to be using weed killer. Slug bait and poisons that are put down to kill rats and mice are really bad news for dogs and cats. Spring is often the time when gardeners are likely to start to protect their plants and crops. It is also the time when cats and dogs are out and about more. If you think your pet may have ingested any strange substance, then contact us immediately.